CHECK THE REST OF ROTOCURVE’S NFL OFFERINGS, HERE! The three “F’s”. Food, Family, and Football. Everyone loves Thanksgiving for one reason or the next. For me, it’s all about the three F’s. Whether it’s a pick-up game, watching three games while eating an overzealous amount of food, or just enjoying time with the family…Thanksgiving is a day to enjoy. I’ve noticed in the last five years, that we’ve added another F to the three Fs. Fantasy. For some reason, this three-game slate is just simply…better than the rest. Without further ado, let’s get into it. I will break down each game, and detail which plays are worthwhile. If you play the three-game slate or if you play the three one-gamers (or both), this is for you! Mitchell Trubisky – The Lions are 23rd in the NFL in defending the QB. Trubisky threw for 355 and three touchdowns while rushing for 18 and a touchdown in the first meeting. If he is active (likely), Trubisky is a fine DFS option, I would play him in GPPs only, simply because despite the -3 spread, I expect the Bears to roll in this game. If Trubisky cannot go, Chase Daniel becomes an interesting option in single-game formats and is a cheap punt in cash games. Update: As of Wednesday afternoon, Chase Daniel is likely to start. Update: Trubisky is OUT. Chase Daniel will start, and is worth a punt if you want to spend elsewhere. Matthew Stafford – There is one thing we do know. The Lions will throw the football. Stafford has at least 36 attempts in four straight games, but he has only thrown five touchdowns in that span to go along with three interceptions and three fumbles. Against a defense like Chicago’s, I’m staying away from Stafford despite the likely volume of passes other than maybe ONE GPP lineup so I can stack Golladay/Ellington/Riddick together…for the upside chances. Tarik Cohen – Cohen will likely be quite popular on Thanksgiving, especially in single-game formats. Personally, I play the Bears’ RBs based on predictive game flow. The Bears -3 is a line I will be targeting, as I think they should have this game well in hand. In that case, I play the Bears’ other running back in Jordan Howard. Cohen could score, but I think the volume goes through Howard on Thanksgiving. I plan to fade Cohen to be different in single-game formats and in full-slate formats. Theo Riddick – Riddick is likely to be the chalkiest player on the slate on Thanksgiving, and I’m using him as a “free square”. With Kerryon Johnson all but out, Riddick is not only going to take over the entirety of passing downs, but he may see a few carries as well if the Lions are down (draws, delays, etc). If you are playing cash games, he is a guy you want to lock in your lineups on DK, and probably on FD with the expected volume he is likely to get. Personally, I will use him in every lineup on DraftKings, because I expect the Bears to be up by a significant margin, allowing the Lions to play in their passing sets for most of the second half. Jordan Howard – As mentioned in the Cohen tidbit, when the Bears have a lead they turn to Howard. Now, Howard has just 17 targets on the season so I am likely to play less of him on DraftKings, but he is a fine FanDuel play given the likely game flow. In the last four games, the Bears have held significant leads in each game. Howard has at least 12 touches in all four games, and has at least 14 in three of the four games. He hasn’t scored since Week 9, but I think that changes this week against a Lions team that ranks 23rd in the NFL in allowing fantasy points to opposing backs. LeGarrette Blount – OK. So last week when Johnson got hurt, Blount filled the void. The problem? He ran for one yard on seven carries. In the last four weeks, Blount has carried the ball 21 times and has 16 yards. He has not scored since Week 7. Blount will likely be more popular than he should, even with Johnson out. For me, I am avoiding him in the full slate, but I think he is worth a punt in single-game slates with the possibility for a touchdown. Personally, I don’t want to go this route in a game against the Bears where Riddick is likely to see more snaps. Zach Zenner – Everyone remember Zenner? The preseason darling from a few years back may return to action this week, as he is quite simply a better athlete than Blount. Should the game turn into a blowout, expect Zenner to get some work over Blount. If Blount continues to be ineffective, expect Zenner to get some work as well. I am not playing him in the full slate, but if you want to be completely different in single-game formats, he is worth the risk. Kenny Golladay – Golden Tate is gone, Marvin Jones is banged up, and the Lions’ other receivers are Ellington and Jones. Golladay should play every snap, and there is no reason to expect less than 10 targets from him on Thanksgiving. He has 27 targets in the last two weeks, and has caught 14 of them for 191 yards and two touchdowns. For as good as the Bears’ defense has been, they still allow the seventh-most fantasy points to opposing receivers. With game flow likely going Golladay’s way, he’s a fine play in cash and GPPs, and a captain candidate in single-game formats. Allen Robinson II, Anthony Miller, and Taylor Gabriel – I’m lumping the Bears’ WRs together, as it’s a rarity for one to shine alone. In the last two weeks since Robinson has returned, he has 15 targets, Miller has nine targets, and Gabriel has 12 targets. If you play Trubisky in GPPs, the best one to pair him with would be Robinson given the volume/ability, but after him it’s likely Miller, who has scored in each of the last two games and three of the last four. I would not play a Bears’ WR in cash games. Bruce Ellington – If Ellington suits up (likely), he’s quite an interesting name for a small Thanksgiving slate. With Jones out, it was Ellington, not TJ Jones, that picked up the bulk of the slack…and took Golden Tate’s snaps. Ellington saw nine targets last week, and missed snaps since injuring his back. With the likely game flow and the pass rush of the Bears, Ellington is a sneaky WR3 option on DK, and a very interesting option in single-game formats. Trey Burton and Michael Roberts – Both tight ends are extremely touchdown dependent, and are only in play in single-game formats if you like to make multiple lineups. If they luck into a touchdown, great. But it’s hard to count on their volume. Burton is used in the red zone a bit, but that’s about it. I’m off both tight ends. In this game, I like the Bears‘ defense. You’ve read it many times in this breakdown…but with the way I predict this game to go…the Lions should be throwing quite often. This gives the Bears ample opportunity to score fantasy points with their elite pass rush and opportunistic secondary. I am unlikely to use either quarterback in this game in the full slate, but for those playing single-game formats…Colt McCoy holds the ability to throw and run, so he has chances for a touchdown or two at a low price. Personally, I think this is by far the worst of the three games and the most likely to score the least amount of points (holding the lowest over/under) so I don’t love targeting quarterbacks in this game. Ezekiel Elliott – Zeke is the only back on this entire slate that has 25-30 touch potential. Per our opportunity tool, he has 247 carries/targets combined (opportunities) which is second to just Todd Gurley…who has his bye this week. Second on this slate in opportunities is Alvin Kamara, who now splits time with Mark Ingram. and has touched the ball over 20 times just once since Ingram has returned. This means, by default, Zeke is the number one back in terms of opportunity. In GPPs, I think playing Elliott over Kamara is a solid pivot, as Kamara will hold very high ownership in what is a perfect situation. Elliott is worth playing in all formats because of his opportunity, but it is not an ideal spot. I will use him as a leverage pivot from Kamara in GPPs to differentiate, however. One thing to note on Elliott is since the Cowboys’ changed their offensive situation a few weeks back…he has been targeted 20 times in three games with 17 catches. Adrian Peterson – I expect the Redskins to ride AP heavily on Thanksgiving without Alex Smith. The problem is, he does not have a great ability to catch the football. If the Redskins are down by multiple scores…it kills AP’s value. With that being said, if the game flow goes AP’s way, he has a high ceiling. I would use AP moreso on FD than DK, but in single-game formats he’s worth a look given his touchdown upside. Cooper busted last week with just 36 yards on five targets, but last week was the Zeke Elliott show. If the Redskins can contain him, Cooper could be in for a target-laden day in a great matchup. Cole Beasley – Beasley dropped an easy TD last week, but hauled in five of seven targets. He is only in play in single-game formats as a cheaper play…but the upside is extremely limited. WAS has struggled a bit to WR, but Beasley isn’t exactly a big-play threat. Josh Doctson – This is a bad matchup for any Redskins’ WRs, but Doctson leads the way in terms of volume. In single-game formats, he’d be the upside WR I would play from WAS. Harris and Quinn are very low-upside players, but Harris would be second to Doctson. Jordan Reed – Reed caught a TD from Colt McCoy last week after Smith went down, and he saw 11 targets. For a player at a premium position on a tiny slate, Reed is likely to be heavily owned. He is the tight end I am targeting this week, simply because he is the best option in the passing game for WAS, and McCoy seemed to recognize that last week. DAL is 23rd in the NFL against tight ends too, which gives Reed a boost. I expect this to be a low-scoring game, but that doesn’t mean either team will have a ton of opportunities to accrue fantasy points. I’m off both defenses in this matchup. Both Drew Brees and Matt Ryan are fantastic plays in this game, as it is inside with a 60 fantasy point total. We’ve seen that even in a blowout, Brees still gets his (363/4 against Eagles last week). Personally, I think that Ryan will throw many more times…so he is the volume play of the two…but Brees has 11 TD in the last three weeks and hasn’t thrown more than 36 times. If you can fit Brees, get Brees in your lineups. But, both are worth using. For me, I will use both in separate lineups…but if I had to play one in cash it would be Matt Ryan at a price discount. Both teams are ranked 29th and 30th against QBs, respectively. Alvin Kamara – Do you remember Week 3 in this matchup? Kamara was targeted TWENTY TIMES. He caught 15 passes for 124 yards. On DraftKings, Kamara scored 37 fantasy points and did not score a touchdown. Of course, that was without Mark Ingram, but still. Without a doubt, Kamara has the highest upside of any player on this slate given the matchup, he has to be a lock in cash games. I talked about a possible pivot in Elliott in GPPs, but that is strictly a leverage play to be different. This is not a spot to fade Kamara because of lack of likely production, and we’ve seen he can get his even with Ingram in the lineup. For me, I’d play Kamara in cash, Elliott in GPPs, but if it’s possible to fit both…that is awesome construction. Tevin Coleman – Coleman’s volume is just simply not there. He has carried the ball just 43 times in the last four games combined and has only seen 17 targets. Now, his price is reflective of this at just $5,200 on DK and $6,500 on FD. To me, he’s more of a GPP play on DK than FD and I wouldn’t play him in cash games. He has upside receiving the football, but he is likely the third option in the passing game behind Julio and other Falcons’ WRs. GPP play only, DK for me. Ito Smith – In single-game formats, he’s worth a shot if he can get a cheap TD, but I’m not playing Smith at all this week. Michael Thomas and Julio Jones – You can’t go wrong with either, obviously. Of the two, I’m personally going with Jones because of opportunity. Jones has 111 targets to Thomas’ 91, and in an odd turn of events Julio has scored in three straight games. The last five games have been insane for Jones, as he has at least six catches in each, at least nine targets, and over 104 yards in each game with TD in his last three. In what is almost undoubtedly going to be a game where the Falcons chase, Jones could see an absurd amount of volume, and I want that on my DFS teams this week. I will play him over Thomas in more of my lineups and he is the cash play over Thomas, in my opinion. Thomas is a great play as well, but it will be very hard to fit both into your lineups. Calvin Ridley – Ridley is likely to be active for Thursday Night Football, and he is a solid GPP option, but I would not recommend him in cash games. Ridley averaged 14 PPR points per game on DK, but he has only scored that many four times this season. That means what? Upside. Ridley has two multi-touchdown games, and only one game with over 75 receiving yards. The floor is low, but the upside is there. The first game against NO? Ridley caught 7/8 targets for 146 yards and three touchdowns. Tre’Quan Smith – I hope Smith plays, because he would become my favorite mid to value tier WR. It may seem like point-chasing, but this is a very similar spot to last week for Smith, as he will get the second and third corners for a team that struggles in the secondary. Last week with all the attention on Kamara/Ingram/Thomas, Smith caught 10 of 13 targets for 157 and a touchdown. His longest catch was for 38 yards, so he just repeatedly beat the Eagles’ CBs all day long. At his price, he’s the top WR3 on the board for Thanksgiving. Mohamed Sanu – If Ridley can’t go, Sanu could be primed for a terrific spot with an uptick in targets. With Ridley in though, Sanu is just a secondary option in that offense as he has zero touchdowns since Week 6 and under 100 yards since Week 4. If Ridley has to sit, Sanu becomes a nice option in all formats. Brandon Marshall, Keith Kirkwood, Austin Carr – The secondary Saints’ receivers after Smith (if he plays) will be a key to this slate. Last week, we say Kirkwood with a few targets and Carr scored. But, that was with Marshall on the sidelines. Keep an eye on the status of Smith and Marshall, as that could sway this either way. If Marshall and Smith are both out, I really like Kirkwood. If Marshall and Smith play, I’m off Kirkwood and Carr and Marshall becomes a flier in single-game formats. If Smith plays and Marshall is out, Kirkwood is a flier. For me, I want to use Tre’Quan Smith most, but he has to be healthy. Luckily, we’ve detailed each situation above so we’re ready to build lineups. Whoever gets significant snaps for the Saints’ offense will have DFS value in GPPs, it’s gotten to that point. I’m using essentially 100% Jordan Reed, but Austin Hooper is worth a flier as a TE2 behind Reed, as he has seen 19 targets in the last two weeks and at least 6 PPR points in all but two games this season. Saints – This is a play based on opportunity. I expect the Falcons to be chasing the Saints all day, which could mean close to 50 passing attempts from Matt Ryan. That is worth playing a defense against, given they will have a ton of snaps to seize a sack, turnover, or pick six. I like the Saints defense this week, and they’ll be the second defense I use after the Bears. 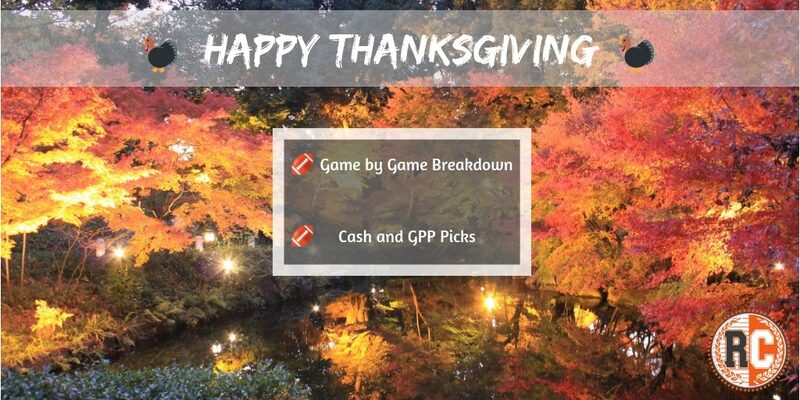 BE READY FOR A SPECIAL BLACK FRIDAY FLASH SALE ON ROTOCURVE!